Imagine yourself on a boat in the Gulf of Mexico, fishing the deep-blue offshore waters of south Louisiana. You’re sitting beneath a tall oil rig 20 miles out, enjoying the calm seas and the company of good friends. Now imagine, if you can, that every time you drop a line over the side, you catch a hard-fighting fish. Not every tenth time or every fifth time or every other time. Every time. You put shrimp on a jig, count it down as you pull line from your reel, then somewhere in the mid-depths, 50, 60 feet down, a fish snatches it up, your rod bows, your drag hisses, and another battle is on. I never thought I’d see that day either. But I have on at two occasions. It happened just as described in the above scenario. The fish we caught were triggerfish, and we actually hooked one nearly every time we put out a line. You may not be familiar with the triggerfish. Little has been written about it in outdoor magazines, and you’d probably find only a few technical references at the library. Nevertheless, the triggerfish is fast becoming one of the most popular Gulf game fish – and for good reasons. When you consider that triggerfish are in the same league with red snapper and grouper as gourmet fare; when you consider that triggerfish are great fun to catch and provide plenty of action even when other more popular fish have lockjaw; when you consider that many more favored gamefish have been thinning out under the oil rigs lately; it’s easy to understand why the triggerfish, an abundant yet underutilized resource, is headed for star billing. Two species of triggerfish are caught in Gulf waters: the gray triggerfish (Balistes capriscus) and ocean triggerfish (Canthidermis sufflamen). They’re weird looking, with a compressed, almost diamond-shaped body, high-set eyes, a thick-lipped “beak” and a head that comprises a third of the fish’s total length. The body is covered with rough, leathery skin, hence the common family name “leatherjackets.” Other family members include queen, finescale, redtail, rough and sargassum triggerfish. The gray triggerfish, also known as the common or spotted triggerfish, is the species usually caught by Gulf anglers. It’s found in Gulf coastal waters and in the Atlantic from Nova Scotia to the West Indies. As the name suggests, it’s usually grayish in color. Streaks and spots of turquoise and emerald color the fins. The ocean triggerfish, or ocean tally, is found near the bottom further offshore than the gray triggerfish. They usually occur in water that’s at least 100 feet deep. Gray triggerfish, on the other hand, are sometimes found in small numbers and sizes in inland bays. Larger adults are common around oil rigs starting in about 40 feet of water. The ocean trigger isn’t as colorful as the gray, usually dark brown with mottled sides. Both species attain a length of two feet and may top 10 pounds. Sharp spines on the back give triggerfish their name. The two front dorsal spines lock upright to protect the fish from predators. These spines can’t be lowered unless the short spine behind them – the trigger – is pulled. 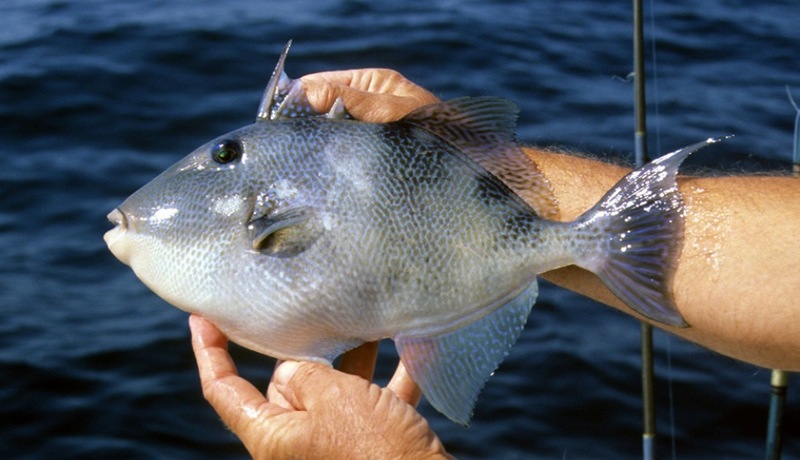 Anglers should handle triggerfish carefully to avoid the spines. Also beware of the trigger’s sharp teeth and powerful jaws. It’s not unusual for large fish to bite through the shank of a hook. Triggers have sharp, chisel-like teeth at the front of each jaw, which they use to hack holes in barnacles, oysters and other shellfish they eat, and if you’re careless, they can take the end off your finger with one snap. Always carry a pair of pliers for removing hooks. Triggerfish are usually found around oil rigs, wrecks and man-made reefs. They’re strictly a saltwater fish, with no tolerance for brackish water or the marshes. They can be caught year-round on a wide variety of baits and have no fear of boats and man. Some anglers use heavy tackle for saltwater fishing, but that takes the fun out of catching triggerfish. On our excursions, we used our favorite largemouth bass fishing gear spooled with 10- to 20-pound line. If you have one, use a rod with a long handle. That gives you leverage when playing fish. If you use a rod with a pistol grip, you don’t have as much to hold on to, and you can get tired of reeling in fish real quick. Our rig was just a 1/4- to 3/8-ounce baited leadhead jig tied to the line. A piece of shrimp or squid on the jig hook makes great bait. Triggerfish are nibblers, so anglers must watch their line closely to detect a biting fish. Let the bait fall until you see the line twitch or go slack. Triggers often feed up; that is, they’ll get the bait and swim up with it. All you may notice is a lack of weight on the line. If you think a fish is on, don’t jerk hard to set the hook. That’s because the trigger’s mouth is bony, and if you jerk, the hook slides across so fast, it can’t find anything to hold on to. What you want to do is just lift up on your rod and hold steady pressure. If a trigger’s there, you’ll hook it. Groupers, snappers and other bottomfish often are landed when fishing for triggerfish, but none has the tenacity of this little-known scrapper. When hooked, the triggerfish darts around in tight spirals with enough power to make you believe a much larger fish was on the line. Even the small ones – 2 to 3 pounds – put up a furious fight. These fish are incredibly strong and can give a seasoned angler all he wants on light tackle. In Florida, the triggerfish’s status as a gourmet eating fish is well established. Charter boats cluster around reefs where the triggers school, and restaurants proudly bill them as the “fish of the day.” Along much of the Gulf coast, however, anglers still shuck them overboard, claiming “They’re too hard to clean,” and “There’s not enough meat to make it worth the effort.” These are the same fishermen, by the way, who’ll spend half the night peeling their way through 10 pounds of crab legs or crawfish for a few ounces of meat. Actually, about a fourth of the triggerfish is edible, and filleting one isn’t exceptionally hard. The trick is to cut from the tail to the gills, not vice-versa, then fillet the meat from the skin. Use a sharp, sturdy knife to slice through the leathery hide. The firm white fillets are great on the grill or broiled or fried or blackened. In fact, anything you can do with snapper, redfish or largemouth bass is as good, or better, with triggerfish. Anglers should keep no more than the limits allowed where they fish. We’re fortunate to have healthy populations of triggers, and if we’re conservation minded, we can keep it that way.